Injection gun (1/10 GAL, 275 GM) , Cable Blocking Kit spare part. Jaco Aerospace and Industrial is your one stop resource for 3M Injection Gun 4470 and all of your 3M Products, Tapes, aerospace and industrial needs. 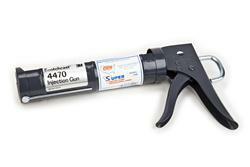 SKU Marketplace Product Description: Injection gun (1/10 GAL, 275 GM) , Cable Blocking Kit spare part.